In 1794 French troops invade the Netherlands and make an end to the old Republic. A new country is formed by the name of Bataafse Republiek ('Batavian Republic'), later erroneously renamed 'Kingdom of Holland'. Former autonomous enclaves are incorporated in the new state, while France itself annexes several parts in the south. Freedom of religion is declared, and soon the first new catholic churches are being built, while some older churches change owners. Around the beginning of the 19th century a renewed interest in Classical architecture emerged. This was an international phenomenon, that in the Netherlands owed much to the French influence of that time. During the short-lived, so-called Kingdom of Holland, a puppet-state under French rule, king Lodewijk Napoleon (the 'emperor''s brother Louis Napoleon) stimulated architecture, which in the Republic had become an almost extinct form of art since the 17th century, by sending young talented students to art schools in Paris and Rome, where they learned designing in the neo-Classical style. Secondly, in several places in the southern provinces, where the old churches had been returned to the catholics, he personally paid large sums of money for new protestant churches. These so-called Napoleon-churches, like the one in Hilvarenbeek (NB) as seen here in the left picture, usually were small, straightforward buildings in a modest neo-Classical style. The king himself had the much more ambitious plan to build an enormous dome-church in Apeldoorn (G), which was to be used by protestants and catholics alike. It never happened, and the plan vanished along with the kingdom. In 1813, after the defeat of Napoleon, French influence ended, but the taste for neo-Classicism remained. This style continued to be the leading one for the design of townhalls, courthouses etc., and churches, many of which were needed. Protestant churches had to be build in those cases where an old church had been given back to the catholics, and many more new catholic churches were needed in those places where the protestants kept the church in their possession. 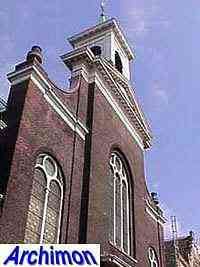 In 1824 a new law was passed that regulated subsidization of new churches. Because of an insufficient number of architects, and because the government was paying for them, the construction of all new churches was to be done under supervision of civil engineers from the Waterstaat ministry (Ministry of Waterways, Building and Roads). In many cases these engineers designed the churches themselves, in other cases they cooperated with architects. For this reason, churches from that time are often referred to as 'Waterstaat-churches', while 'Waterstaat-style' became almost a synonym for neo-Classicism. Unlike often is suggested, the choice for this style had nothing to do with a preference of the ministry; it was simply the international and national taste of that time that made it the most prolifically used style. But during the period of governmental supervision, which continued to excist until 1875, churches were build in various different styles, including early Neo-Gothicism (the so-called 'Willem II Gothicism'), and in variants of neo-Classicism that escaped from the typical "Waterstaat-style" label. Although 'Waterstaat-style' is a misleading and derogatory term, it is still often used for a certain style which is also known under the more accurate name of neo-Grec, after the obvious inspiration taken from ancient Greek temples. Churches in this style are recognizable by their simple hall-like structure and obvious classical elements like a facade decorated with (often non-supporting) pillars and a tympanum. On top is usually a small bell-tower, often decorated with a lantern. A majority of these churches were built for the Catholics. Here, the interior in most cases originally was in a baroque style, again after the taste of that time. Often faked decorative elements have been used; plaster vaults, round wooden beams painted to look like marble etc.. Protestant churches from the outside looked almost similar, but had a more sober interior. 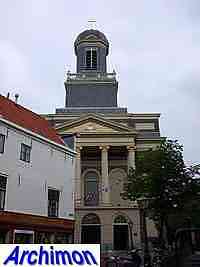 A typical example of this style is this catholic church in Leiden (ZH) from 1836, the O.L. Vrouw Onbevlekt ontvangen, designed by Th. Molkenboer, one of the leading architects of this period. Another important architect is T.F. Suys from Belgium, whose most important work in the Netherlands is the St. Antonius van Padua in Amsterdam (NH), built in 1839, which is inspired by British and especially French neo-Classicism. With its two towers it is unusual for this country. Besides neo-Grec, there were some other neo-Classical variants used for new catholic churches. These are in a more modest style, similar to traditional 18th century architecture, and lack pillars. 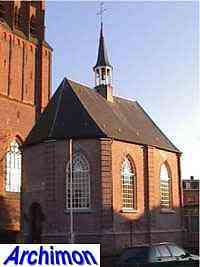 The St. Bonifatius in Dordrecht (ZH) is a typical example. 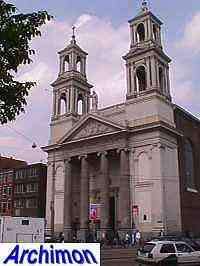 For protestant churches other variants of neo-Classicism had been used from the early 19th century onwards. These styles usually are Classical in details only, and often refer to styles that were already used in the 17th century. Especially the stretched octagonal ground-plan is popular. 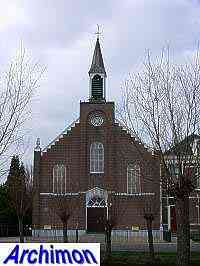 The reformed church of Boxtel (NB) from 1812 is only one of many examples. 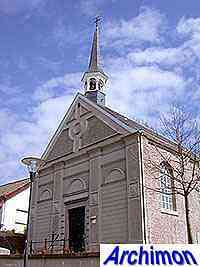 A special category of protestant churches was built in several places in the province of Limburg. From 1830 until 1839 this province had been part of Belgium and churches that had been confiscated by the protestants were returned to the catholics. The Belgian government ordered the construction of small replacement churches for the protestants, like this one in Meerssen which dates from 1837. Another example is found in Beek. As the catholic self-consciousnes increased after 1850, neo-Classicism soon was regarded as 'pagan'. Neo-Gothicism became the catholic preferred style and many neo-Classical churches were replaced by neo-Gothic ones, often only a few decades after they had been built. By that time the neo-Classical monopoly had already been broken for protestant churches as well, with many churches being built in the early neo-Gothic style, until neo-Renaissance took over the role of preferred protestant style. 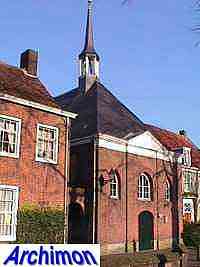 The last variant of neo-Classicism that was widely spread in the Netherlands is found in early churches of the Gereformeerden, a branch of protestantism that emerged in 1834 and was outlawed until 1848. This denomination continued to build churches such as this example in Molenaarsgraaf (ZH) until the 1890's, although by that that time neo-Renaissance had become much more important.